Keratoconus is an eye disorder in which the customarily round cornea takes on a conical shape. In rare cases, it may be necessary to treat keratoconus with a corneal transplant. However, in most cases, an optometrist can provide patients who suffer from keratoconus with custom-shaped contact lenses that can control the bulging of the cornea and correct vision. At Southwest Eyecare & Laser Medical Associates, our team of experienced eye care professionals understands the meticulous attention to detail that must go into crafting contact lenses for keratoconus. The success of this treatment depends on finding precisely the right lens for the individual patient and making sure that it fits perfectly. In providing contact lenses for keratoconus at our Bakersfield, CA eye care practice, our team carefully evaluates each individual patient to ensure that he or she is matched with the lens solution that will provide the optimal combination of vision correction, comfort, and corneal health. If you have been diagnosed with keratoconus, or if you are experiencing any of the symptoms of keratoconus, we urge you to schedule a consultation with one of our esteemed eye care professionals today. If you are currently experiencing any of the following visual symptoms, then you should seek immediate diagnosis of your condition. You may be suffering from keratoconus, a condition that can most likely be managed with contact lenses. These could also be symptoms of other conditions; however, they are all abnormal and should be considered cause for concern. What Types of Contact Lenses Are Used to Treat Keratoconus? In the earliest stages of keratoconus, it may be possible to correct vision with soft contact lenses or even eyeglasses. However, as the cornea continues to change shape, rigid gas permeable contact lenses will most likely be required to provide the best possible visual correction. Standard gas permeable contact lenses may be sufficient for some cases of keratoconus, but for more severe cases, scleral contact lenses may be more suitable. Scleral contact lenses are large-diameter gas permeable contact lenses that cover the entire surface area of the irregularly shaped cornea and rest on the white portion of the eye, or the sclera. In essence, the scleral lens replaces the bulging cornea with its smooth, rounded surface to restore clear vision. All contact lenses come in a variety of sizes to ensure the comfort of the patient. 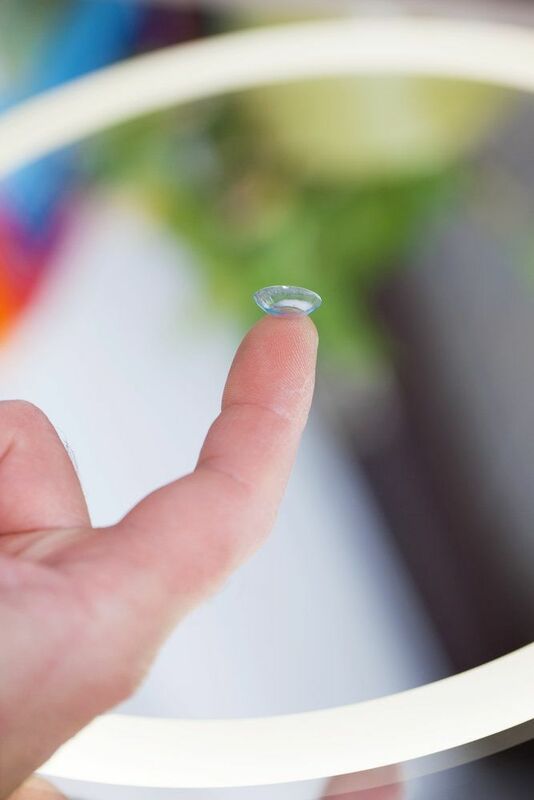 Our doctors carefully evaluate each patient’s eyes before recommending the contact lens solution that is best suited to his or her unique case. Even if a corneal transplant is ultimately deemed necessary, contact lens therapy may still be required as an adjunct. If you would like to learn more about contact lenses for keratoconus, or you wish to schedule your initial consultation with one of our eye doctors, please contact Southwest Eyecare & Laser Medical Associates today.